Bad Advice #1: Got a leak? Use some grease instead of gear oil. This is terrible advice. We have opened up final drives and found grease in the planetary hub. Gear oil is thick, but it still flows like a fluid so that all the key components are bathed in it while the final drive is running. Grease doesn’t really go anywhere, and will not be able to protect the gears and bearings while the final drive is operating. Even if you pack that final drive with grease, it will not carry away heat like gear oil does. Additionally, it is not rated for high pressure applications, meaning that it cannot protect surfaces like gear teeth and bearings when the forces get intense. If you want to destroy the planetary hub on your final drive motor, using grease instead of gear oil is a great start. 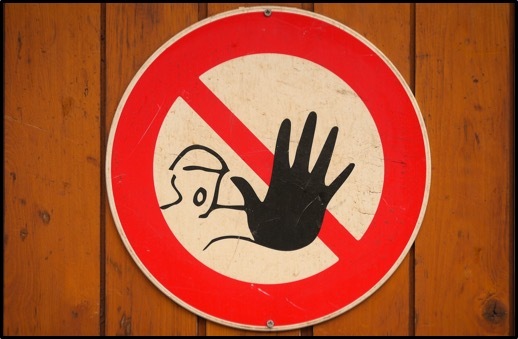 Bad Advice #2: Got a leak? Just keep topping off the gear oil. Topping off the gear oil until you can find time to get the leak fixed may sound like a good solution, but two issues come into play here. First, there is rarely a convenient time to get a leak taken care of. Second, and even more importantly, is the fact that if gear oil can leak out then contaminants like dirt, sand, and water can get inside. Water and oil don’t play well together. Abrasive particles like dirt and sand will damage component surfaces, reducing drive performance and eventually causing a catastrophic failure. Address leaks right away -- get those seals replaced. Bad Advice #3: Gear oil doesn’t need to be changed very often. We’ve opened up plenty of final drives that are full of sludge in the planetary hub. A thick, dark, smelly, useless mess with the consistency of pudding that does far more harm than it does good. This is the result of not changing out the gear oil regularly, preferably according to manufacturer’s guidelines. 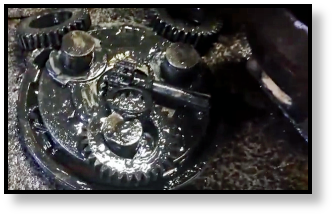 Even if it is never exposed to contaminants, gear oil is going to degrade with time. Eventually, it breaks down chemically and no longer serves it purpose; this is why it needs to be changed out periodically. 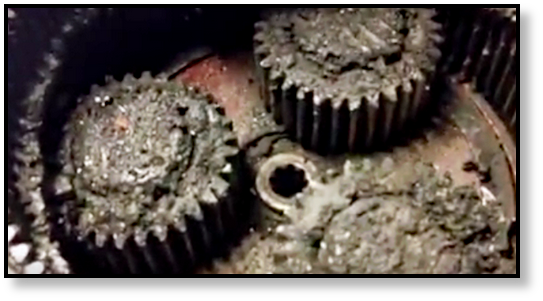 Use gear oil, not grease, in the planetary hub of your final drive motor. When your final drive starts to leak, get those seals replaced as soon as possible, not just when it is convenient. The longer you wait, the more expensive the damage will get. And, finally, check and change the gear oil on a regular basis. Ideally, you should check the oil level about once every 100 hours of operation, and change the oil out at least once a year.